After indulging in too many sweets and junk food in the weekend, I try my best to eat healthy during the week. I usually make my own salads and healthy food at home. Recently, I came across a healthy food concept called The Green Fridge. The Green Fridge is a delivery and pick up only concept, that is located in Dubai Investment Park. You can either pick up from them directly or order online. They deliver all across Dubai. The Green Fridge’s concept is all about ‘Healthy Eating’. 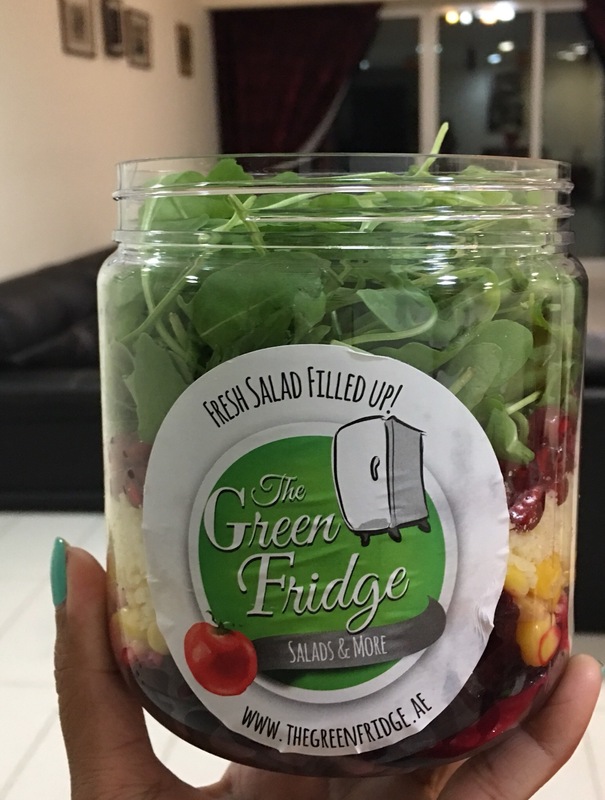 The Green Fridge puts together a nutritious and delicious meal in a handy, colorful and reusable jar. From healthy salad jars to breakfast that will keep you full all morning, our products have all been carefully selected to satisfy a wide variety of appetites and tastes. They’re fast, convenient and just as good to look at as they are to eat. You can trust The Green Fridge to bring you some of the healthiest food in Dubai, all meticulously tested for flavor, freshness and nutritional value. Join us today and start being kinder to your body. This creative salad concept offers readymade salads as well as make-your-own salad along with breakfast jars, soups, wraps and fresh juices. From their Sala-Meal jar section of the menu I ordered Moroccan Couscous. It was a meal in itself and consisted of couscous, beetroot, black beans, sweet corn, pomegranate, feta cheese and baby rocca leaves with balsamic dressing. Its fun to get creative isn’t it? So for my next salad meal, I created my own. It had all my favorites like avocado, green lentils, cherry tomatoes cucumbers, spinach and pine seeds in a tangy lemon dressing. Greek Quesadilla Wrap was amazing. All their 12 inch wraps are stuffed with satisfactory amounts of protein, lots of veggies and light ingredients. Then toasted to perfection. The Greek Quesadilla had a nice combo of veggies and Halloumi cheese with pomegranate dressing. There is nothing better than having a healthy fruit as a dessert. And that’s what I did. Their Fruit Salad had a medley of freshly cut fruit pieces in honey-lime dressing that was presented in a pretty little jar. I loved everything that I tried from The Green Fridge. The food was not only healthy and nutritious, but also fresh, tasty and flavorful. I really enjoyed my meal. 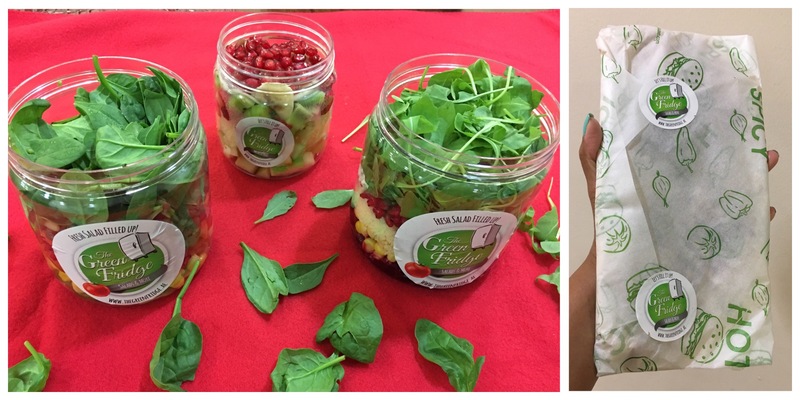 Their PET jars used for salads are reusable and can be recycled. As my location is far from DIP, they took more than an hour to deliver. If you are looking for a healthy yet delicious meal then you can order from The Green Fridge. I’ll be definitely ordering from them again.